Manila is dissected north and south by the Pasig River and of course, many esteros. 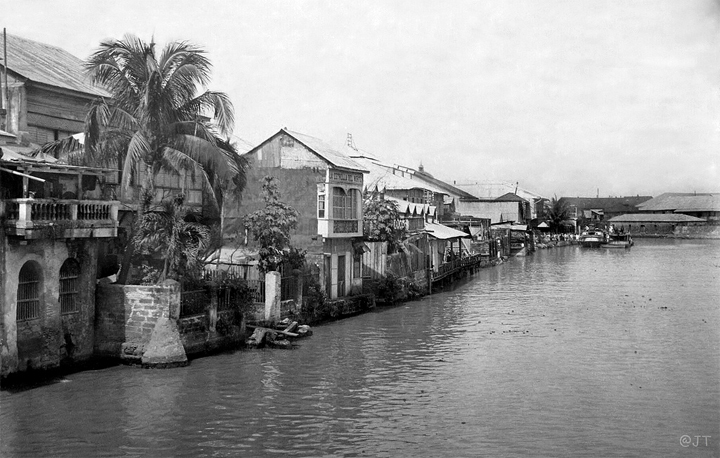 As a matter of fact in the early 1900s, Manila had been referred to as “Venice of the Orient”, I guess before they called it the Pearl of the Orient, but I digress. Living in Manila in the early Fifties and Sixties, we used to make our way to the stores, restaurants and theaters in the Binondo and Santa Cruz districts and specifically, the Escolta. 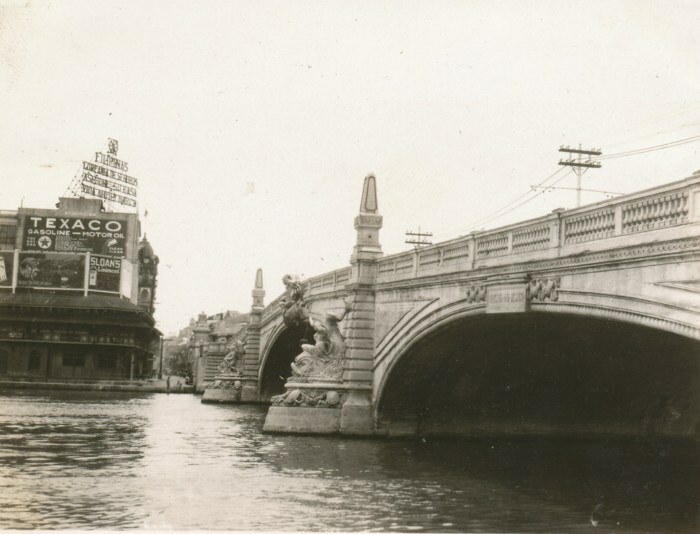 Practically every day I would cross the Jones Bridge towards Plaza Moraga, turn right and head down to our store, the Gem Gift Shop, as well as all the great stores of the time (see my post on the Escolta). I took the Jones Bridge for granted, just another way of getting from one spot to another, not realizing its great history. So, in doing some research, I’ve been enlightened and delighted by what I’ve uncovered. 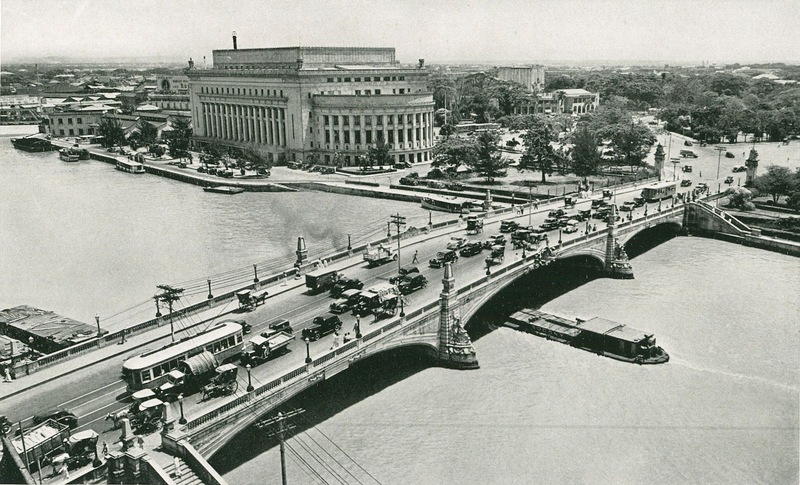 The Jones Bridge was designed by Juan M. Arellano (see his story on my post of the Manila Post Office). It was started in 1916 and finished in 1921, however, to really appreciate this once beautiful pre-war structure, we have to mention its forefather, the Bridge of Spain (Puente de España) so let’s go back in history a bit. 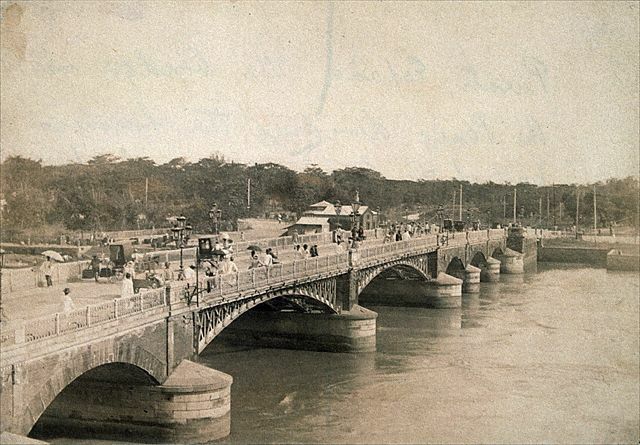 The first bridge to ever cross the Pasig River was the Puente Grande, a ten-span bridge opened in 1630 by the Spanish colonial government. Work on the bridge started in 1626 under the rule of Spanish Governor Fernando de Silva who reported that the city had decided to build a stone bridge over the river. 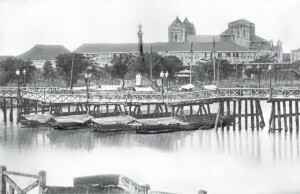 The beam bridge connected Intramuros with the business district of Binondo, making the travel across much easier and faster than the ferry service that existed before. The bridge was completed in 1630, under the rule of Juan Niño de Tabora. The bridge was built without cost to the treasury, as the Sangleys (Chinese) had paid for it since it relieved them of ferryboat charges during their frequent daily business travels to Binondo. In 1814, the wooden superstructures were replaced with stone arches and the stone piers were strengthened. The bridge was also called Puente de Piedra (Stone Bridge), while the old name remained popular. 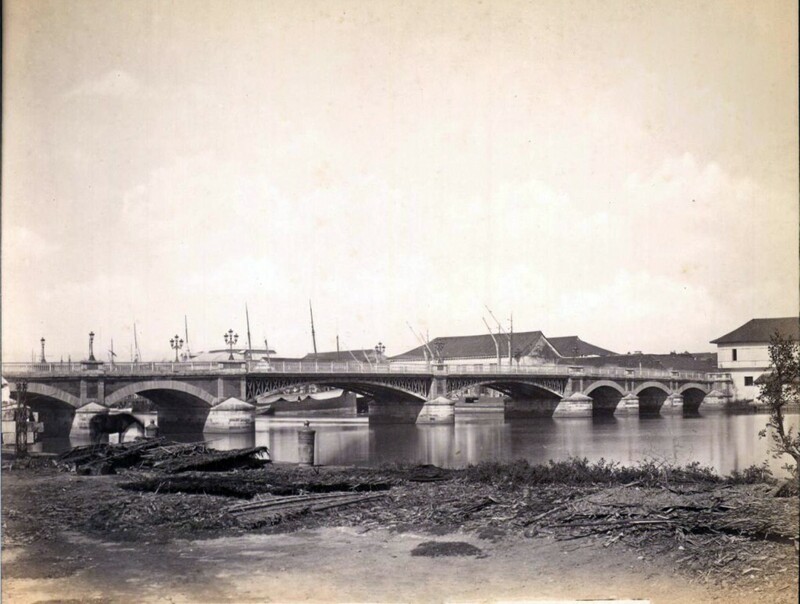 The bridge was damaged when the center piers of the bridge sank during the earthquake of June 3, 1863, one of the strongest to hit the Philippines that leveled most of Manila. 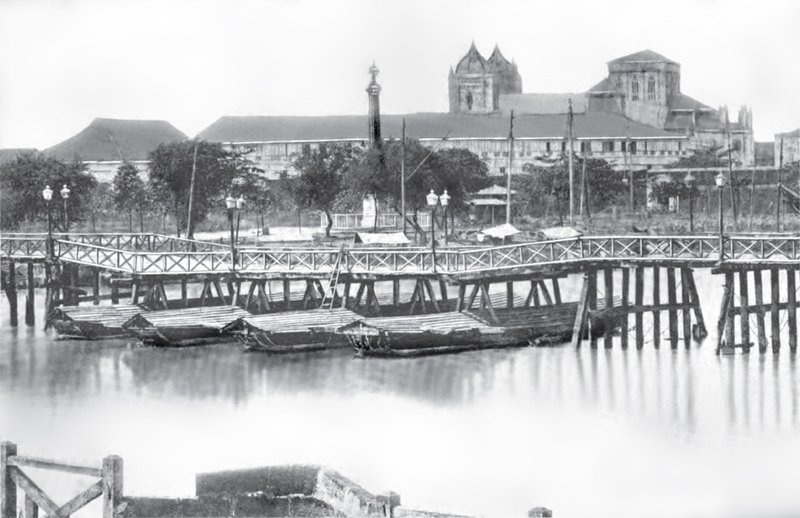 While the bridge was being assessed and repaired, a temporary pontoon bridge called Puente de Barcas (Bridge of Boats) was constructed one block below on Calle Rosario. 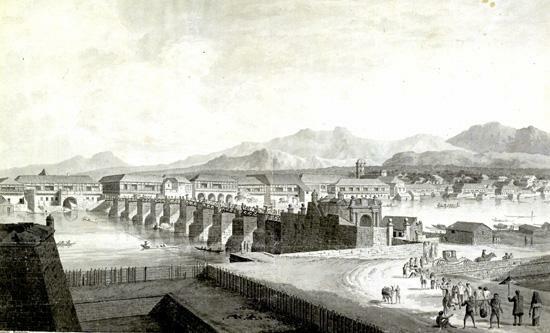 In the middle of the bridge, the spans were supported by cascos, or large flat-bottomed boats common in the area. 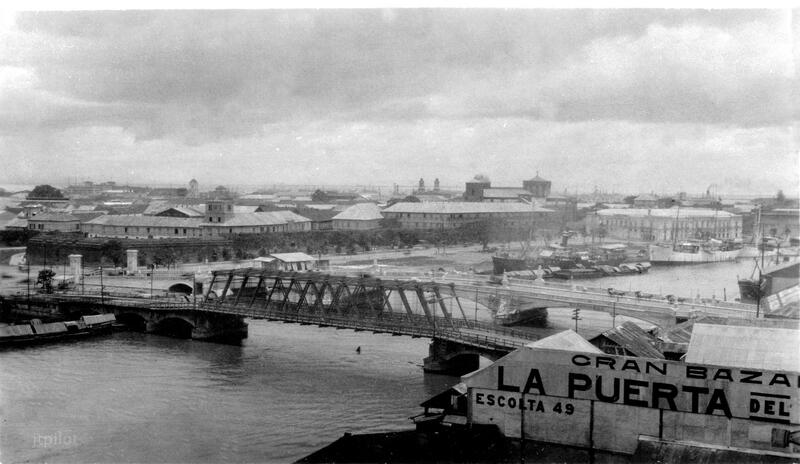 Puente de Barcas (Bridge of Boats) In the background are the newly constructed Santo Domingo Church and Magellan monument. During the reconstruction of the bridge, the two piers near the center were removed lessening the number of spans to eight. 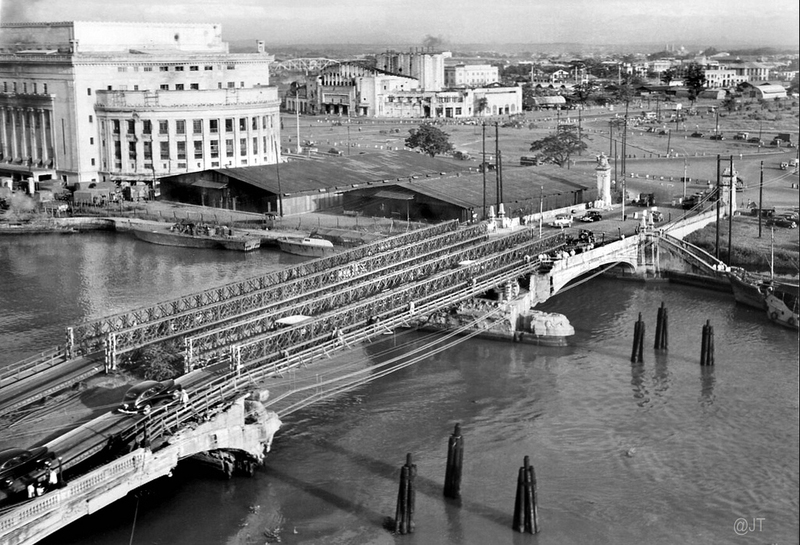 Two steel ribbed central spans were used to span the space left by the removed piers. The bridge was opened on January 1, 1875 and was renamed as Puente de España. The bridge stood as a strong and picturesque monument to the ability and engineering skill of the early Spanish engineers. Its massive arches of stone supporting a paved roadway that withstood the heavy traffic demands, floods and typhoons of nearly three centuries, and its pleasing lines and soft coloring blended delightfully with the verdure-garbed wall of the old walled city of Intramuros. 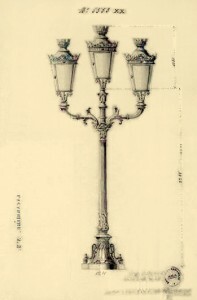 A triple-branched street lamp made by Lacarrière. 19th century. AHN José Echeverría, the engineer posted in Europe, was commissioned to supply the street lamps for illuminating the “Puente de España” over the Pasig River. An eyewitness account from Clay McCauley published in “A Day In the Very Noble City, Manila” – 1899. 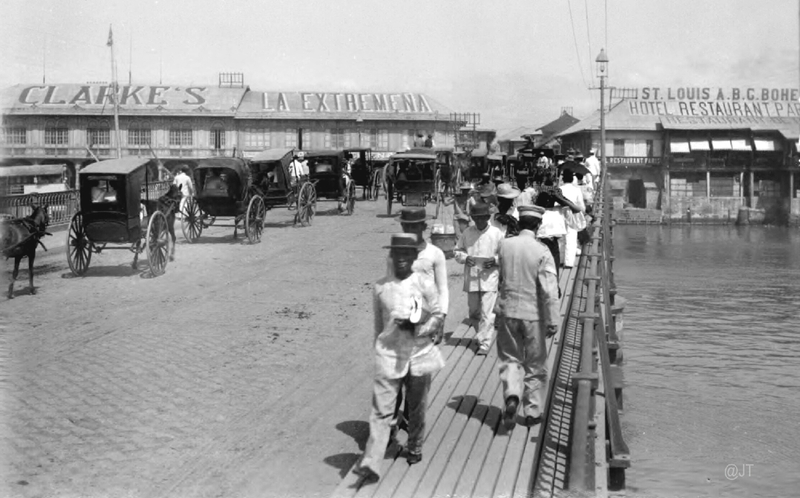 The bridge remained unchanged until 1901 during the American Colonial Era when the bridge was widened to accommodate more pedestrians and vehicles, even with the construction of nearby Santa Cruz Bridge that was started in 1900. 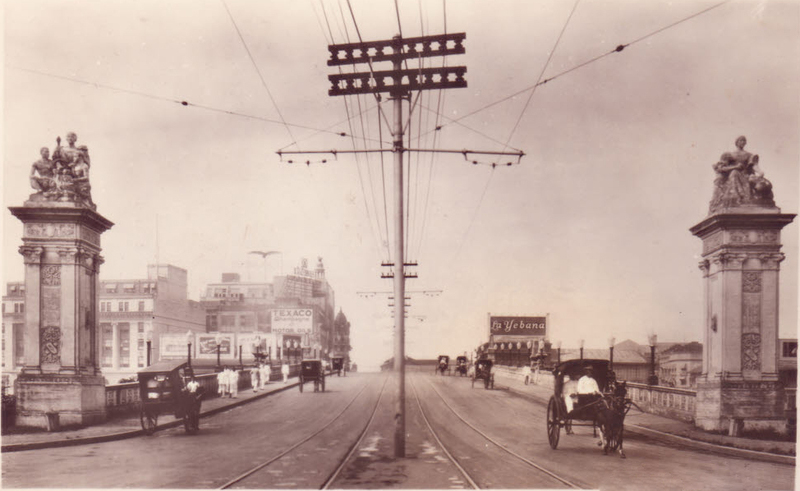 With the addition of additional lanes of traffic, the street lamps on the bridge were removed. 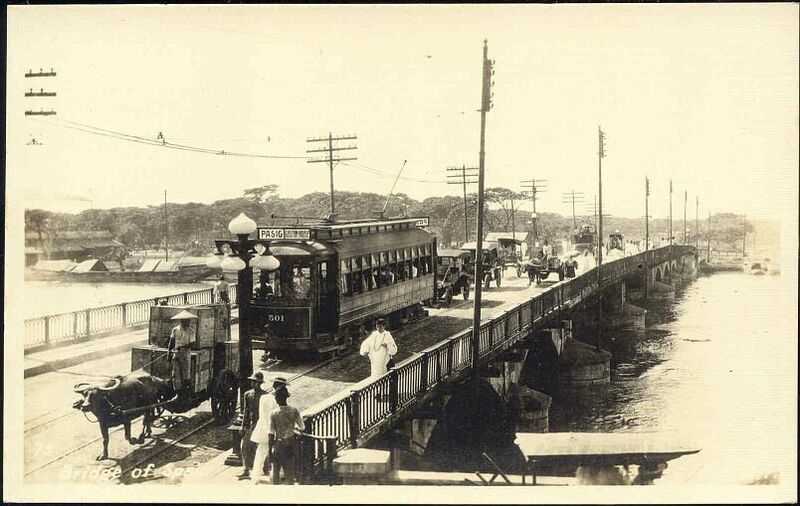 In 1905, tracks were laid on the bridge to accommodate the “tranvias”, a streetcar system that ran throughout Manila. Bridge of Spain damaged in the flood of 1914. 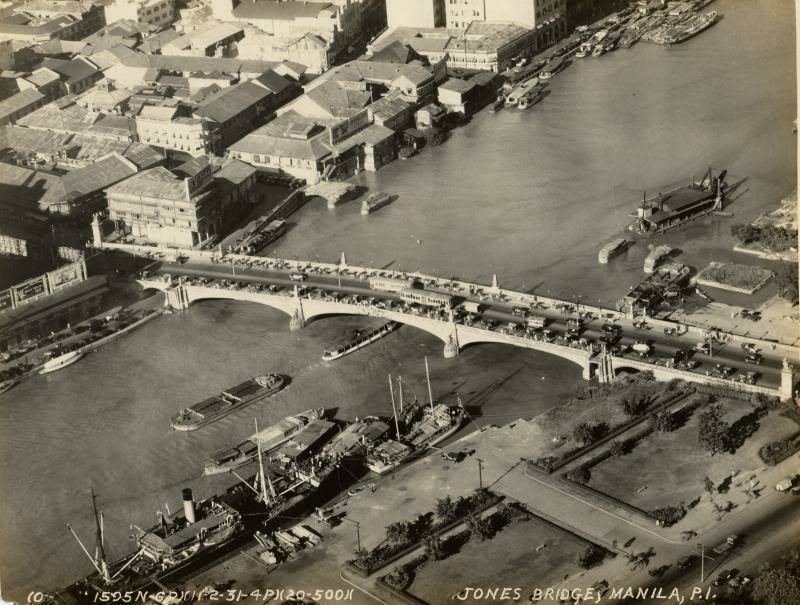 In September, 1914, a terrific typhoon ensued with nonstop rains that flooded the streets of Manila and overflowed the Pasig River. The flood damaged the center pier of the bridge and was removed. A temporary truss bridge was installed after a few months that lasted until the new bridge was completed almost 7 years later. The repair ended up costing ₱22,555.38. 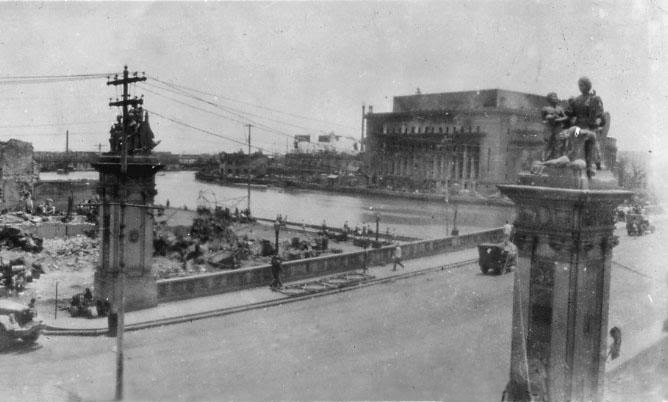 On the destroyed bridge looking north towards the Escolta. 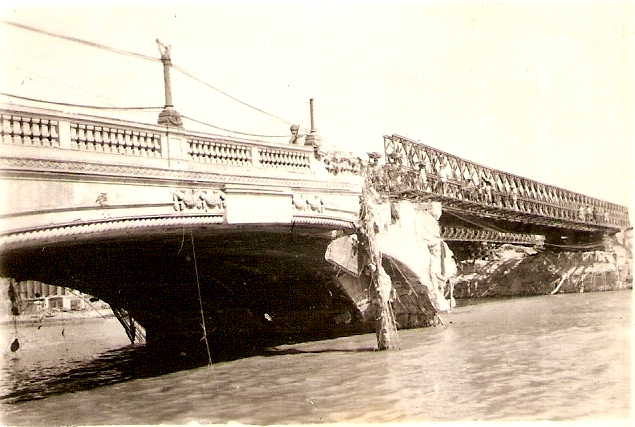 Bridge of Spain repaired-1914. The “new” Jones Bridge project had just been started to the right where the ship was moored. This rare map clearly shows both the Bridge of Spain and Jones Bridge parallel to each other. 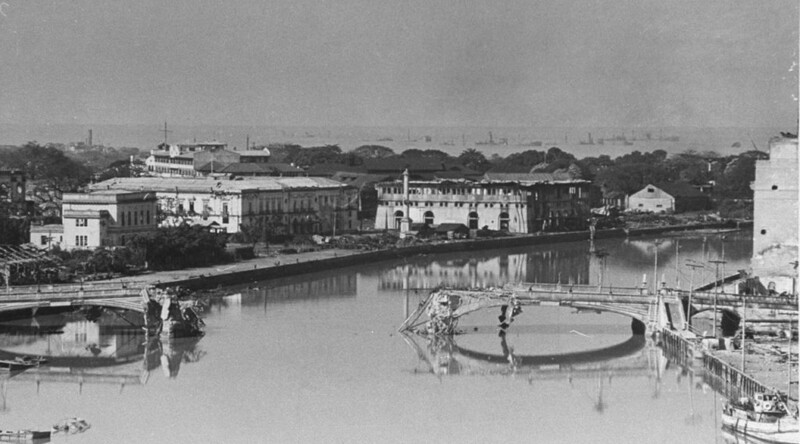 The Bridge of Spain flows into Calle Nueva and the Jones into Calle Rosario. 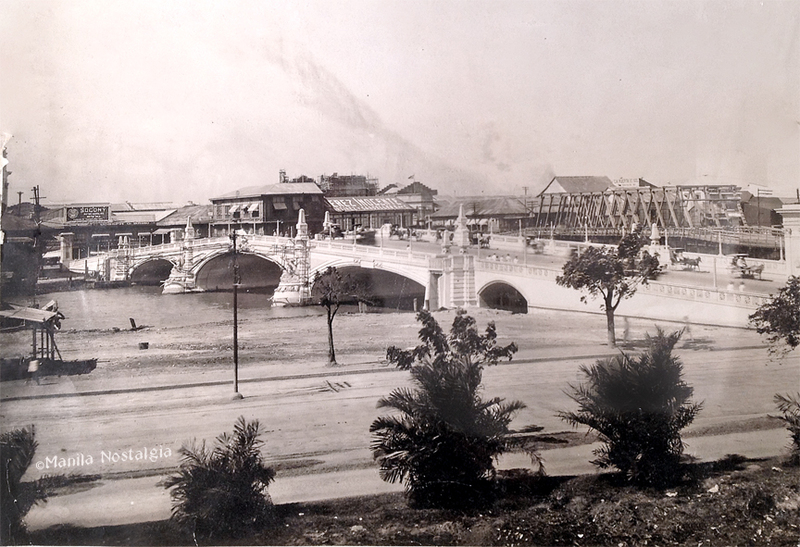 Below, another perspective of the two bridges taken from Paseo Magallanes, c.1921 In this extraordinary photo below, you’ll see the newly opened Jones Bridge, the statue adornments on the pedestals still being completed. Just to the right of it, you will note the old Bridge of Spain footings have not yet been removed. A dredger floating next to the foot on the right appears to be doing the removal. 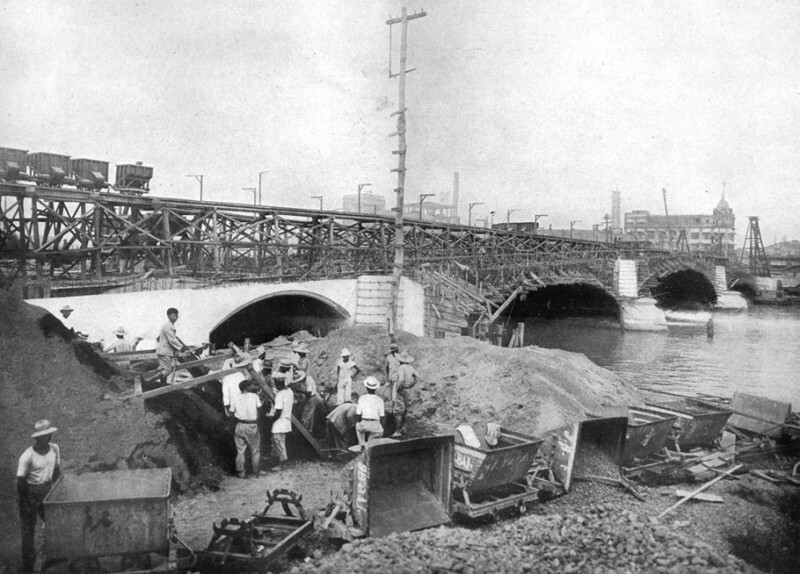 In 1916, Arellano was commissioned to design the new bridge. 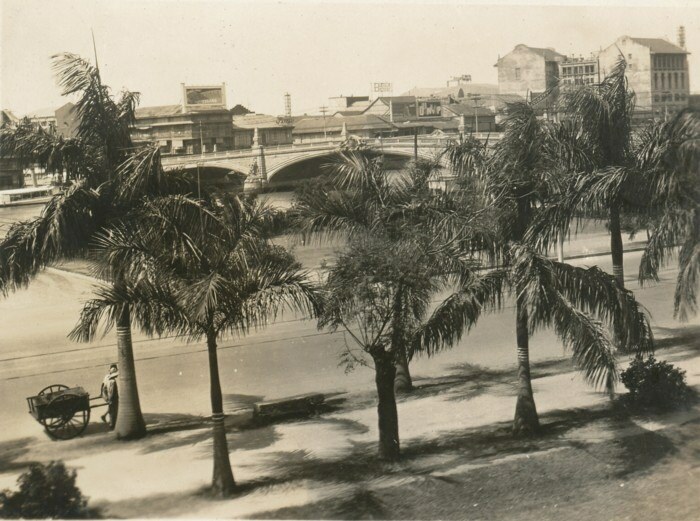 Construction was started on a neoclassical reinforced concrete arch bridge across Calle Rosario on the site of the old temporary Puente de Barcas. 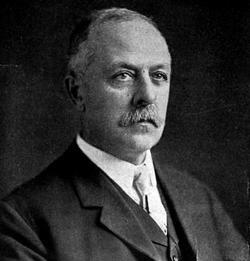 The span was renamed as Jones Bridge after former Virginia Rep. William Atkinson Jones, who was the principal author of the Philippine Autonomy Act of 1916, a bill assuring the future independence of the Philippines. 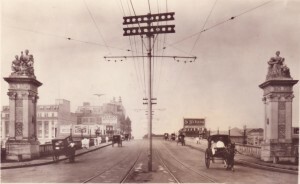 The bridge was completed and opened for traffic in 1921. Soon after, the Bridge of Spain was dismantled ending its long history. 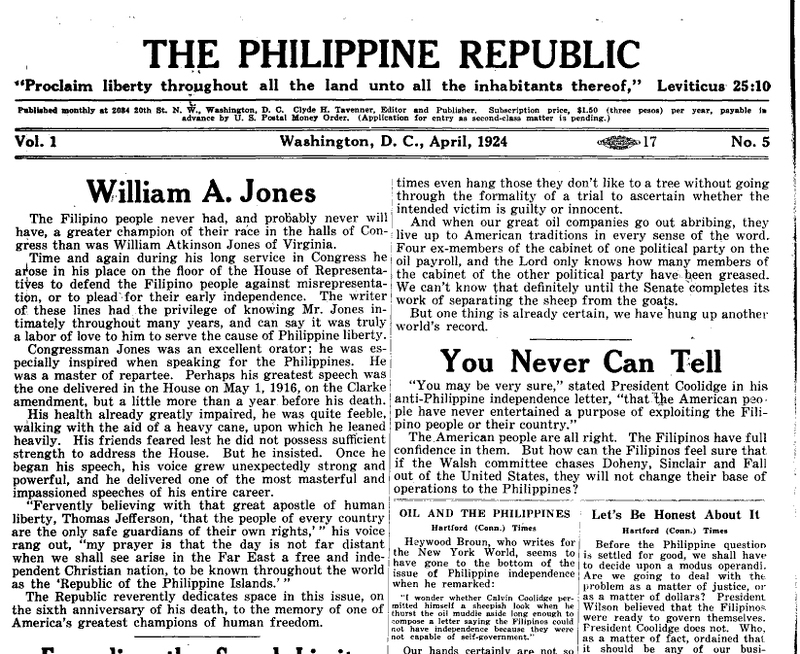 Article about Jones in the Philippine Republic newspaper – Click to Enlarge. The newly designed bridge by Arellano was a magnificent example of beauty and architecture, rivaling any found in the United States or Europe. It was not only graceful but featured four elaborate statues, La Madre Filipina, guarding the entrances. Arellano embellished the piers with a statuary of boys on dolphins, similar to the embellishments on the Pont Alexandre III in Paris (which he visited on the way home from America). 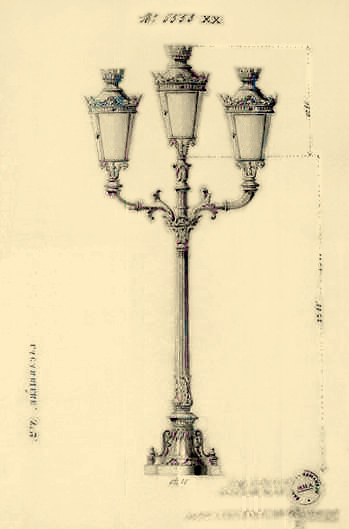 The lampposts, balustrades, finials and moldings were similarly treated. Update: 7/28/2013: The dolphins were created by a well-known German sculptor by the name of Otto Fischer-Credo. Fischer-Credo was born in Berlin in 1890 and studied at the Akademie der Kunste. He attended the Royal Academy of Art in Paris from 1919-21 and lived in the Philippines, Mexico, Cuba and the USA. Source: Public Art Registry, City of Vancouver, B.C. (For more information of Otto Fischer-Credo, please read comments below submitted by one of my readers, “Vancouver Brent”. Quite interesting ! Here’s a recent article I wrote devoted to the works of Otto Fischer-Credo. Out of the four statues of the La Madre Filipina, only three survived to this day. One statue was placed near the Rizal Monument in Luneta Park. 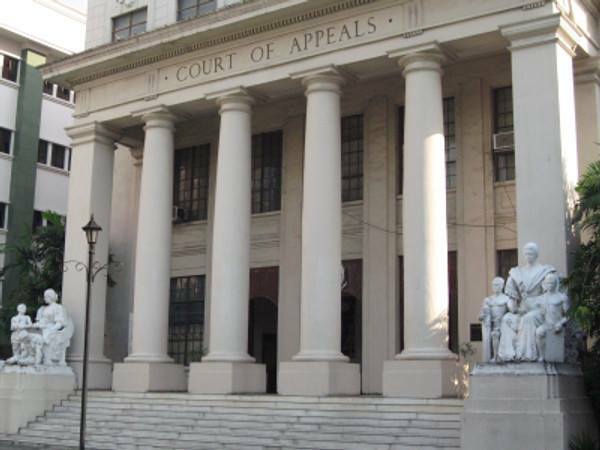 The other two statues guard the entrance of the Court of Appeals Building in Ermita, Manila. However, the fourth statue mysteriously disappeared, no doubt destroyed during the war. 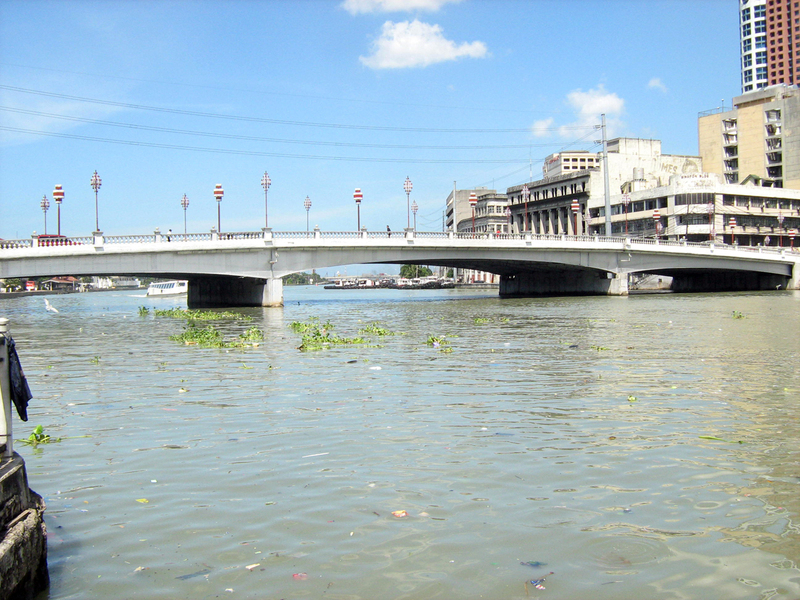 A lovely perspective of Jones Bridge from the south side of Pasig. 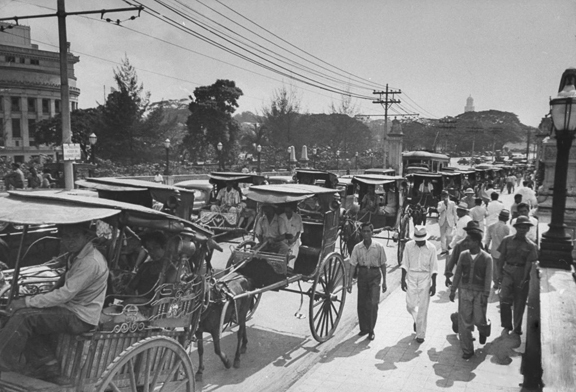 The Japanese enter Manila on January 2,1942 and occupation lasts over three years. 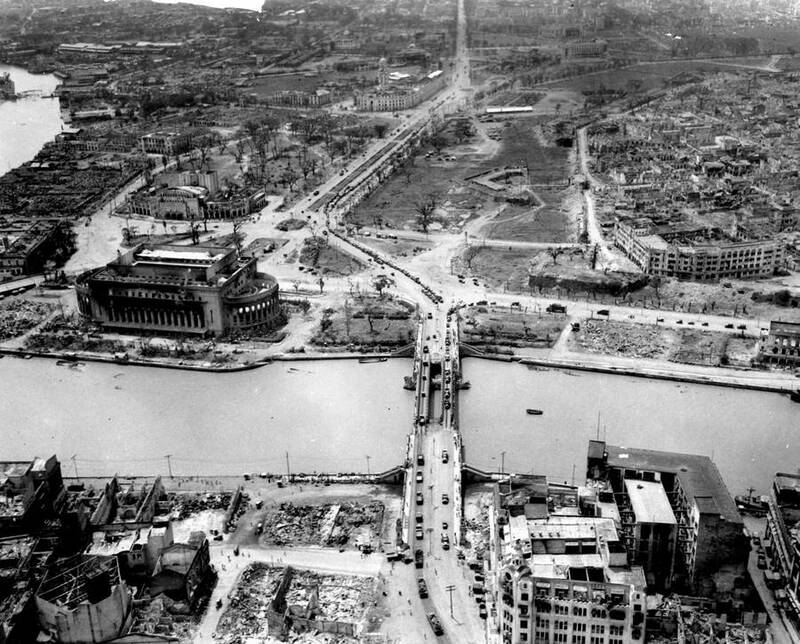 Declaration of Manila as an “Open City” saves most of our architectural heritage however, in order to impede the U.S. forces, the Japanese destroy the beautiful Jones Bridge during the Battle of Manila in February 1945. 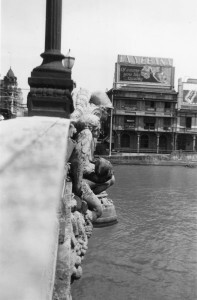 The photo below shows one of the Jones Bridge sculptures adorned with Japanese flags during the occupation. A serene view of destruction – Jones Bridge, 1945. Overhead view of Jones Bridge looking south. 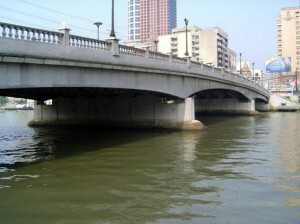 A temporary Bailey bridge was constructed to allow traffic to access both sides of the Pasig and within a couple of years, the new Jones Bridge was built. 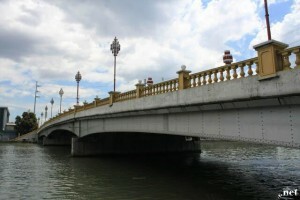 The bridge was reconstructed after World War II through the Philippine Rehabilitation Act of 1946. The original beauty of this marvelous structure was abandoned for a more practical yet completely unaesthetic design. It’s just too bad that Arellano’s legacy had not been carried forward to allow succeeding generations to see how beautiful Manila was in those days of “The Pearl of the Orient”. Again, that perfect Tagalog word, “Sayang”. A recent photo of the Court of Appeals building where two of the Jones Bridge sculpture now reside. 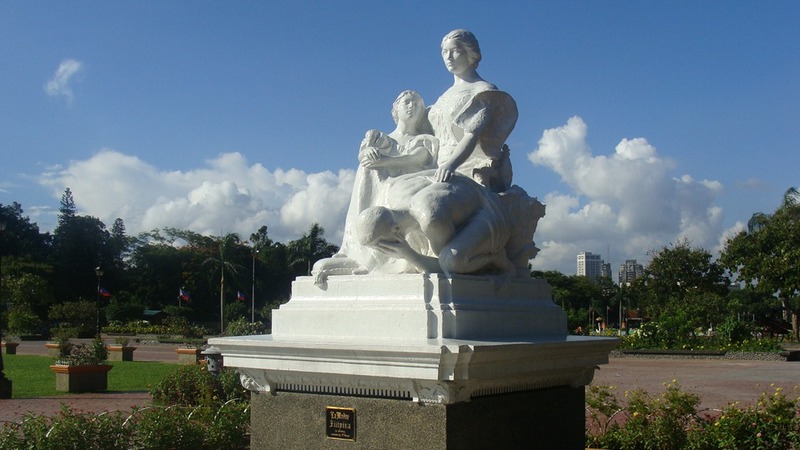 The remaining statue “La Madre Filipina” was relocated to its rightful place of honor in Rizal Park by the Luneta. Write to me with your stories or pictures. I’d love to hear from you ! I appreciate your articles very much, they are very informative. I’ve always been bewildered between the bridge of Spain and the Jones Bridge. Before, I thought they were the same, that the Bridge of Spain was added with additional elements to become the Jones bridge. Thanks for putting the spotlight on this.. It has enlightened me. It was really “sayang” to lose these great structures we had. 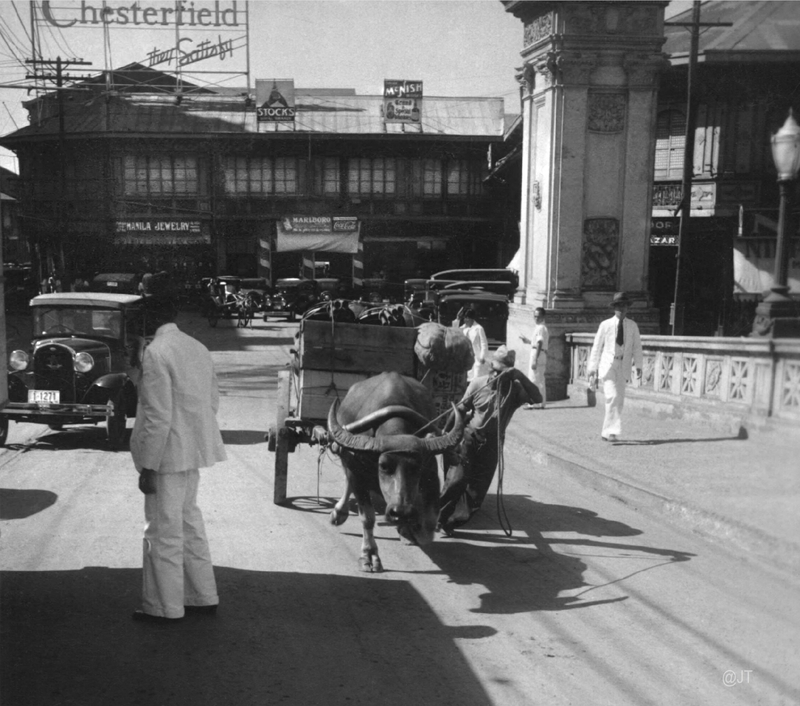 How I wish I could travel back in time to see how Manila was then. 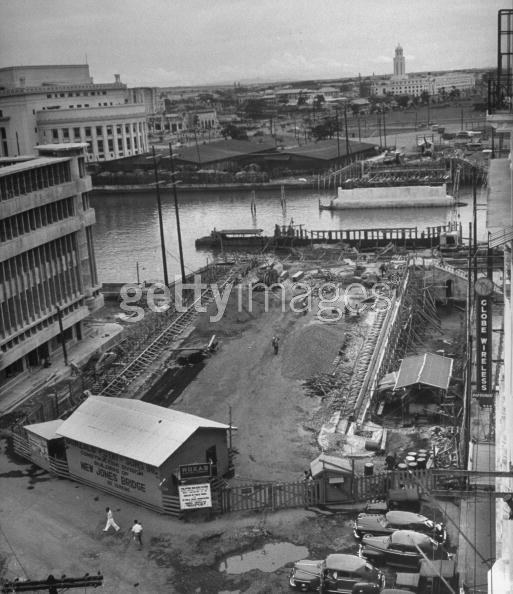 I read Nick Joaquin’s “Manila My Manila” and I got a mental picture of how the place was, how the culture was, a confluence of Spanish, American, and Filipino, the structures, the people, the custom, the things rooted from the foundation of the city. Thinking we’ve lost all these, puts me in deep regret. 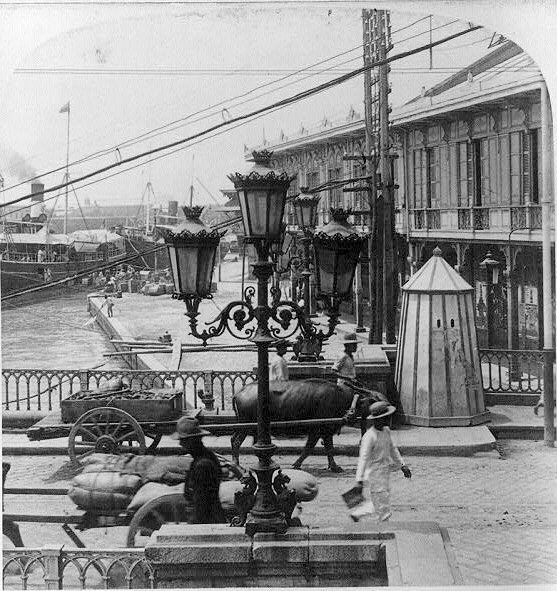 I’ve got a huge collection of pictures of Old Manila. Lou, do you mind if I copy some of the pictures you have in here? The pictures you’ve posted here are rare. I hope I get to meet you. I hope you get to write about the churches of Intramuros someday.. Lourdes, Santo Domingo, The Cathedral, Franciscan, San Agustin.. built by the five orders from Spain.. That’ll be interesting!! Your site is great! Keep writing please! At the corner on Escolta at the base of of Jones Bridge was the store my dad ran, La Estrella Del Norte. Thanks for your kind comments Jack. My great-uncle Dr. Eduardo Zaragoza was the Medical Director of Levy Hermanos (La Estrella del Norte) from 1937 to around 1960 or so. I would love to hear more about your dad and the store. Perhaps you may have some photos of the store and Escolta that I’m sure would be very interesting. I am doing a research on the Levy Hermanos, how they travelled to the Philippines and founded Estrella del Norte. I have already quite a bit of data, but of course anything you could add would be very useful. The information I have is essentially related to the beginnings, from their arrival to the death of several of them during the cholera epidemics. I would be extremely grateful for any additional information . A building called Paterno Bldg. was built on the bottom end of Jones Bridge and eventually was used by FEATI University as class rooms. I remember having a few classes on the first floor of Paterno Bldg. looking up on Jones Bridge. David; This comes a year late but was just now able to access this article. I believe the Paterno Bldg was at the Sta. Cruz Bridge, not at Jones Bridge. I HAVE NOTHING MORE TO ADD AFTER MUCH OF WHAT HAS BEEN SAID, EXCEPT – TO THANK YOU ALL AND CONGRATULATIONS. I MUST HACE CROSSED “THE BRIDE” A HUNDRED TIMES. I-Witness is the flagship documentary program of GMA-7, the Philippines’ number one television network, and is hosted by award-winning journalists Kara David, Sandra Aguinaldo, Jay Taruc and Howie Severino. I-Witness seeks to chronicle places, issues, people and events that are of significance and interest to the Filipino people. It has also been recognized here and abroad for its groundbreaking features. It airs locally every Monday night, after our late night news program, SAKSI, and has the possibility of a replay in GMA News TV. It also airs internationally through GMA Pinoy TV. The said episode could also be released in DVD format in the future. For our episode this May, the team of Kara David will trace the tracks of Spanish Colonial Bridges in the Philippines particularly in Luzon. In line with this, we would like to ask permission to use photographs of the Jones Bridge from your website. We apologize for giving such short notice. We look forward to your kind and favorable response. Should you have any questions, please contact the undersigned at 02-982-7777 local 1419, 63939 964 7675 or thru our e-mail address, I-W3@gmanetwork.com. Thank you very much. Hi Raymond, I just sent you an email approving your use of the photographs. I’m pleased you found my site interesting. Estrella del Norte still exists but not at the former Escolta site anymore. It seems to have been bought by some chinese jewellers and is located in Makati. My ninang, who died at 100yrs old, (I am 68) bequeathed me the pocket watch of her father, a gold Omega with gold scalloped chain. What is unique is that it has the logo of Estrella del Norte Manila with the Omega logo. It must be circa mid 1800’s if Estrella del Norte was already around then. Nice writeups ! Keep it up ! Hi Maria, No, the original Puente de Espana (Bridge of Spain) was actually about a block east of the Jones Bridge. So the foundations were taken out when they built the Jones. La Estrella Del Norte! Across the street from C. Sharp & Company where I had my first job at Sharp Travel after going through a training course with Pan American. I spent every lunch hour admiring all the beautiful things at La Estrella Del Norte and spent my entire first pay check on a pair of gold and pearl earrings! Thanks for bring back wonderful memories Lou!!! I didn’t know you worked at Sharp’s Travel. Was that right after high school ? Got your message! I have some other questions regarding those photos. Can I call you up? Lou, my wife, Coty, was a good friend of your Mom. She used to work at Calle David, and I would fetch her every afternoon. As we would pass Gem Gift Shop, she would stop by to chat with your Mom. Ernesto, thank you for sharing that story about my mom . It’s been so long now,since she passed away in 1973. I miss those old days of the Escolta. I hope you are doing well. I’ve lived in Seattle since I graduated from high school in 1962. Are you still in Manila. Yes, I am still in Manila. I have two children in Seattle. If you could retrieve my email address from this sending, email me under separate cover and I could give their addresses to you. You are just a wealth of information and I love your personal points of view as well. Thanks for sharing. What an interesting history of Jones Bridge. I had crossed that bridge nearly every day from 1955 to 1972 and always enjoyed the view. Mt office at ITT Globe-Mackay Cable & Radio was located at the corner of Dasmarinas and Juan Luna Streets and my home was the Elena Apartments in Ermita. I often had to wade across Juan Luna when flooded by 2 to 3 feet of water. The city eventually elevated the street above the water line and turned the lobby of our building, Trade and Commerce Bldg., into the finest swimming pool in Binoondo. Great photos of Jones Bridge. In a weird way that bridge is part of my unrealized fantasy. When I moved to Vancouver in 1969, I became friends with a fascinating, worldy bohemian German family that lived in Lynn Valley, a forested mountainous area of Vancouver. My friend’s mother, Astrid, talked at length about her husband, who was a classically trained sculptor, and travelled the world doing important commissions. Of the many photographs, many were of what I now know is Jones bridge. He did the dolphin sculptures for sure, and probably worked on the pier sculptures as well (he lived in Manila for perhaps 6 years). I was told he also did sculptures for the pediment of a grand building in Manila built around the same time (parliament, or courthouse?). His name was Otto Fischer-Credo and he had an interesting life (ended in the 1970’s). I’m very sad I’ll never see it. The new one is SO DULL!! That is very interesting indeed ! This is the first I’ve heard of Otto. I wonder what happened to the photographs ? Is Astrid still around ? It would be great to get the story documented. Unfortunately Astrid passed away in the 90’s. She and Otto had lived in Berlin in the 20’s and he had trained in the Berlin Art Academy. They lived in Mexico (and were befriended by the artist Diego Rivera) and he did commissions in Cuba in the 30’s. As a German in the 2nd World war, he was conscripted to work as a war artist, glorifying the Third Reich. Hitler and Himmler both sat for him and his sculptural portraits were placed in govt. buildings. In 1945 the Allies destroyed all this work. One portrait of a Philipino woman’s head still exists at UBC in Vancouver. It is unknown what happened to the photos of the Jones Bridge sculptures in progress, but his son, Cornel Fischer-Credo, who lives and works in Florence might know. the structure from vacant lot to a simple yet Filipino touch design old manila style carinderia. We plan to open the restaurant to the public by next week (Feb. 2014). or +6. I look forward to your kind and favorable response. If you have any questions please don’t hesitate to call. Good day. 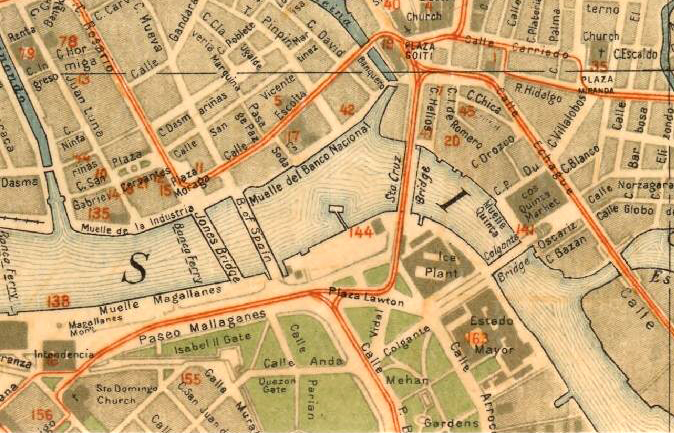 I am very interested with the old Manila maps you use in your articles. 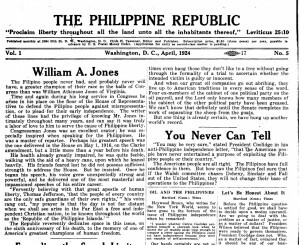 Could I ask for your source of the maps, specially the 1920 Manila maps? Are they accessible online? It would be really helpful for my academic research on Philippine historical maps. Thank you. 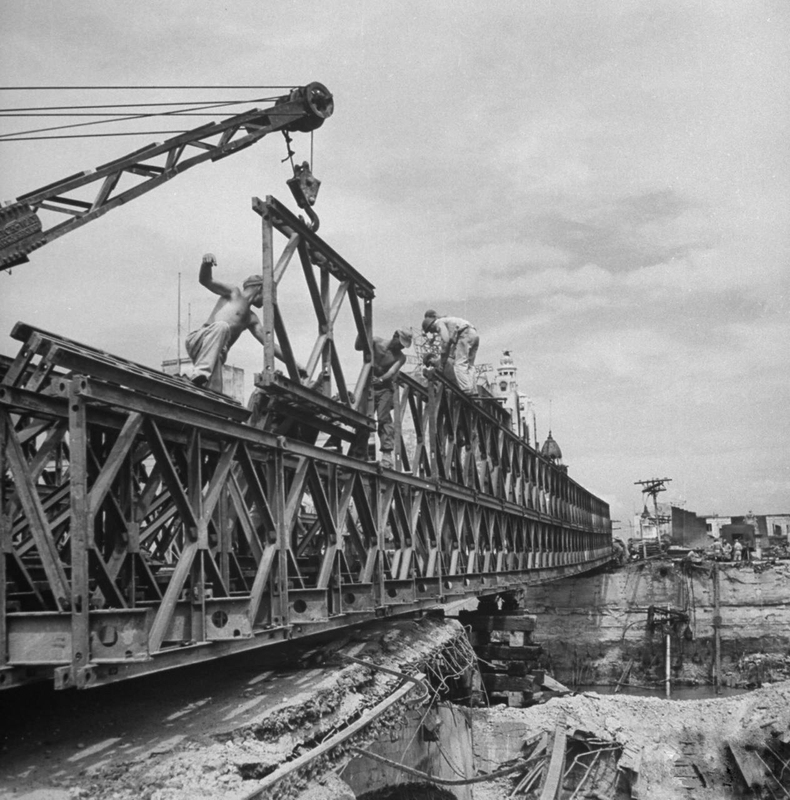 My father always talked about rebuilding the Jones Bridge after the “Japs” destroyed it during the liberation of the Philippines. He was a combat engineer under General MacArthur during WWII. I always wondered what the story was behind this bridge. To see pictures of the bridge with the temporary repairs would have made him happy. Thank you for creating this website, I will not forget that image that make my dad so proud. 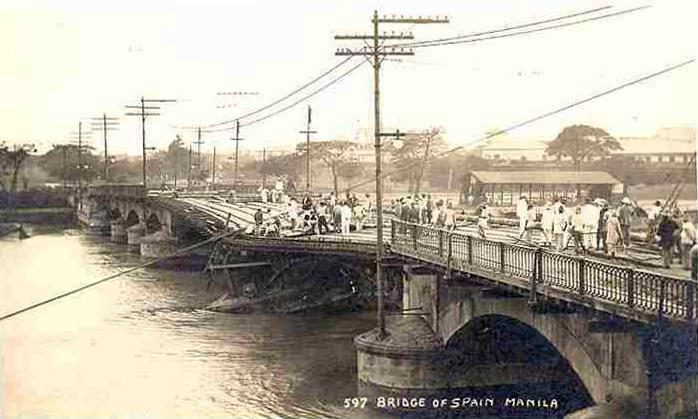 So the old Bridge of Spain if it is still existing today, must be on Yuchengco Street today? Yes. Before it was renamed to Yuchengco St., it was Calle Nueva.